Strauss, W., & Howe, N. (1997). 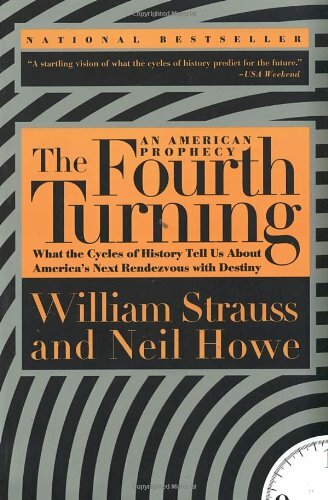 The Fourth Turning: An American Prophecy. Broadway Books; New York. The Amazon review for The Fourth Turning suggests that reading this book will change the way you view the world – and your place in it. These words concisely sum up how I felt after my first exposure to the Strauss-Howe generational theory. Although I’d like to return to the ideas in this book in future posts, for now I will simply provide a brief overview of the work itself. Within this book, readers are led through well-defined generation cycles (called ‘turnings’) which have existed across history. Each turning involves certain social trends, and in combination with the generational archetypes coming of age at the time (artist, prophet, nomad, and hero), have created what we regard as history. Extensively researched, the book illustrates that we are not progressing, nor are we heading towards any fixed point or outcome in our society. Instead, there recurring eras underlying historical events and personages. As we are currently in what might be considered ‘the fourth turning’ (a time of struggle, breakdown, and renewal), our historical understandings will help us to “predict how….generational archetypes will collaborate, compete, and collide with one another as we enter into crisis” (PeakProsperity, June 23rd, 2013). I will have to pick up the 1991 book by these authors, Generations, as I found the descriptions and overviews of the various pendulums, characters, and cycles to be a little overwhelming as presented in The Fourth Turning. I turned to online resources, such as the official website and external resources, for support and guidance. Reading the book has, however, helped me to identify concrete reasons for the different perspectives that I, my parents, and my grandparents possess. I enjoyed finding bits and pieces of my personal history in the broader histories described. Additionally, it helped me understand my own situatedness as a young adult in the present-day socio-cultural milieu. “The Second Turning is an Awakening. Old Nomads die, Heroes enter elderhood, Artists enter midlife, Prophets enter young adulthood—and a new generation of child Nomads is born. This is an era when institutions are attacked in the name of personal and spiritual autonomy. Just when society is reaching its high tide of public progress, people suddenly tire of social discipline and want to recapture a sense of personal authenticity. Young activists and spiritualists look back at the previous High as an era of cultural poverty” (Lifecourse Associates, 2014). Of course, much criticism has been voiced against these theories and ideas. A lack of substantive evidence and the generalization of certain facts may be an issue with the evidence presented in the book; however, I think that the ideas are solid, and have much to offer our way of thinking in these uncertain times. I strongly recommend this book as a reference text – i.e. one that you keep on the book shelf for days you need a bit of mental exercise and philosophical reflection.